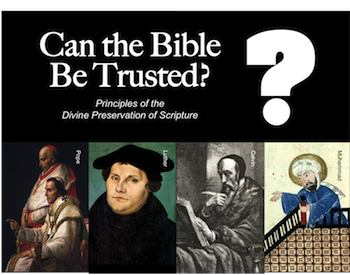 In the previous study, "Can the Bible Be Trusted? Part 1," we looked at the first principle of Divine preservation of Scripture - God's promise. In this material, we will examine two more - God's Presentation and God's Parallels. Can the Bible be trusted? Not only did God promise to protect the Word, but also the way He presented it speaks volumes about the attention He gives to preserving its purity. Peter assures the readers that they could take full confidence in the messages of prophecy because they are "completely reliable." Conclusion: God presents and protects reliability. God did not depend upon the "prophet's own interpretation" for sourcing. Peter seems to go out of his way to say that readers need not be concerned about human influence. Conclusion: God safeguards His presentation from human interpretation. Inspired presentations did not originate in the human will but came about as humans were "carried along by the Holy Spirit." Conclusion: God maintains control over the Source of His presentation. While explaining the inspirational process might very well be outside the ability of the human mind to grasp, we can know this; God's message is "reliable," safeguarded from human "interpretation," and the Source is fully controlled by Him. As a result of that Divine effort in presentation, it seems reasonable to conclude that the same efforts are Divinely assigned to the preservation of Scripture. When leaders within Calvinism, Reformed Theology, Catholicism, etc., make the elitist claim that they must filter Scripture in order for us common folks to understand it, they return us to the Dark Ages. Not only does God promise to protect His Word (see #1), He even presented it in such a way that elitist tamperers were put on notice. (See also Revelation 22:18-19.) In order to be sure of God's message, always let the Bible interpret the Bible. Can the Bible be trusted? When the awesome God of Scripture wants a principle understood, He does not simply state it, He weaves that message in and out, round and round, and side by side. Consider baptism and each of these three Divine harbingers of harmony. In and Out - The doctrine of baptism has been woven in and out of the timeline fabric since the opening chapters of the human story. Consider Noah, 1 Peter 3:19-21. Notice what is said about Moses, 1 Corinthians 10:1-2. Think about the forerunner of Christ, John the Baptist, Matthew 3:4-6. Look at Jesus, John 4:1. Is it any wonder then that the early church continued that in and out woven pattern of baptism, Acts 2:38; 8:12-13, 38; 9:18; 10:48; 16:15, 33; 18:8; 19:5, etc.? In and out preserves purity! Round and Round - The doctrine of baptism is presented as a Divine dance between two realms. The physical and spiritual interlock in complementing motions that circle round and round the same principle - birth, a new beginning. Read John 3:5 and 1 Peter 1:3. Notice the use of both physical and spiritual birth to explain the essential nature of baptism. Round and round preserves purity! Side by side - Lest we miss the importance of baptism, God also uses multiple side-by-side illustrations to impress upon our hearts and minds the purpose of immersion. In 1 Corinthians 3:6-7, baptism parallels a planting. In Romans 6:3-4, baptism parallels a death, burial, and resurrection. Onthe connection between John 3:5 and 1 Peter 1:3, baptism parallels a birth. In Acts 22:16 baptism parallels a bath. Side by side preserves purity! Note: The doctrine of marriage is validated in the very same way. This confirms that homosexuality is a perversion. Unfortunately, Calvinism, Reformed Theology, Catholicism, etc., have promoted such a lack of trust in Scripture that the Pandora's box of selective obedience is now wide open. With the popularization of such pick and choose doctrines, is it any wonder why so many of our young people are struggling to accept the Scriptural condemnation of this perversion?! There is a great difference between human filtering and human discovery. The first starts with man's agenda. The second pursues God's agenda. The awesome God of Scripture longs for human discoverers, but He does not need human editors! His promise, His presentation, and His providential parallels ensure that the living Word of God (1 Peter 1:23) is more than capable of defending itself - in and out, round and round, and side by side. In order to be sure of God's message, always let the Bible interpret the Bible. Can the Bible Be Trusted? "Part 3"
Back to Top of "Can the Bible Be Trusted? Part 2"